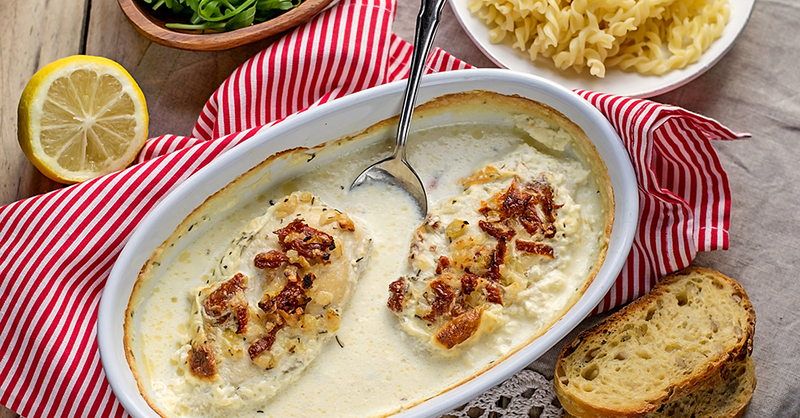 If you are looking for an easy dinner recipe with a touch of sophistication, this creamy chicken bake fits the bill. It starts with chicken breasts that are lightly browned and then baked in a silky smooth sauce. Sun-dried tomatoes and roasted garlic add rich layers of flavor that take this chicken recipe to a whole new level. It’s easy to get stuck in a rut when it comes to making chicken in new and interesting ways, but we promise you this dish is dinnertime gold. It’s packed with flavor and will have people raving! Whether you make it when you have company over, or if you just want to treat yourself to something delicious, this is a sure-fire winner every time. Heat olive oil in medium skillet over low heat. Place chicken breasts in oil and brown lightly on both sides, about 6 minutes total. Transfer chicken to baking dish. Keep medium skillet over low heat, and add chicken broth and heavy cream to pan drippings. Whisk together until sauce reaches a boil. Pour sauce over chicken breasts and bake for 20 minutes. Remove chicken breasts from baking dish. Strain sauce, then pour it back into medium skillet. Bring sauce to a boil and gradually stir in flour until thickened. Add water or white wine and continue cooking for 1 minute. Remove sauce from heat. Stir in parmesan cheese, and add salt and pepper to taste. Return chicken and sauce to baking dish. Top chicken pieces with sun-dried tomatoes and roasted garlic. Return to oven and bake for 10 minutes. Garnish with chopped basil before serving.